La Lunatica: As the owner has not responded to my previous log requesting that they check this cache I am archiving it. 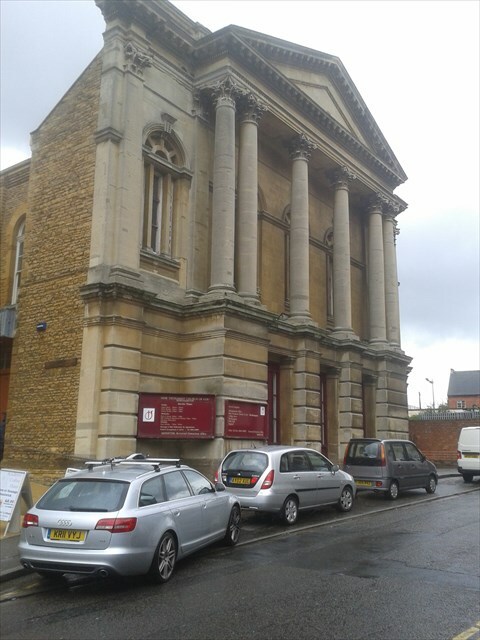 There is within in the ‘Inner Ring Road’ of Northampton a number of Churches, all are within walking distance of each other. You are looking for a magnetic 2mil vile. There is no need to look on any ‘Church Grounds’ or walls. The Church was taken over by the present owners The New Testament Church of God a number of years ago. The New Testament Church of God has their headquarters in the town as well. COLLEGE STREET CHAPEL is the second oldest Free Church centre. In its origin it was secession from Castle Hill Meeting, though friendly relations were maintained between the two, and the members met for some seventeen years at Lady Fermor's house in the south quarter. The 'Church Covenant' at the time of the formal establishment of a Baptist church is dated 27 October 1697, and the chapel in College Street was built in 1712. Beginning as anInde pendent, it became a Baptist community. As Castle Hill is associated with Doddridge (1729–53) so College Street is connected with the Rylands, father and son, the elder famous for his ministry (1759–86)and his school; the younger (minister 1786–93) for his friendship with Carey and share in founding the Baptist Missionary Society (1792). The College Street Chapel was rebuilt in 1863 it is this building that can be seen today.